The answer is it all depends on the image. In the last few years, virtual reality, including Second Life, has faded from the technology hype cycle. But as I recently discovered there is still life in the old dog, as demonstrated in this lunch time lecture titled Transformed Social Interaction in Virtual Reality from Harvard University’s Berkman Center for Internet & Society. 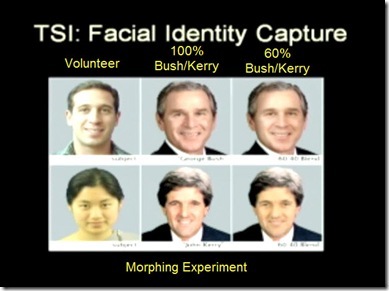 An untouched photo of George Bush and an altered photo of John Kerry (a 60/40 morph of the untouched photo with 40% of the volunteer’s facial features). 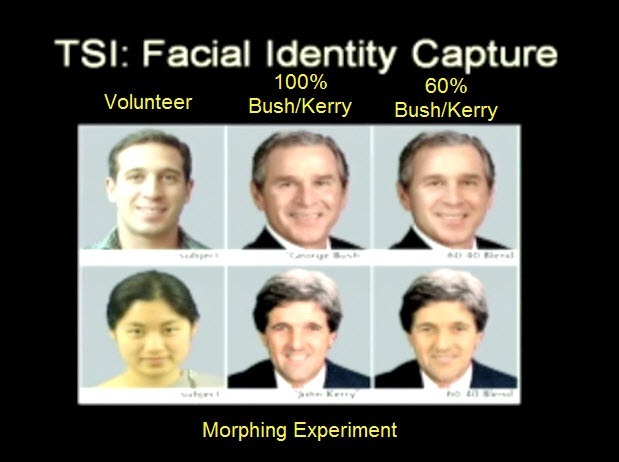 An untouched photo of John Kerry and an altered photo of George Bush (a 60/40 morph of the untouched photo with 40% of the volunteer’s facial features). Why 40%? Anything below that figure is not perceived as “odd” by the volunteer. So what was the result? It is very very scary. 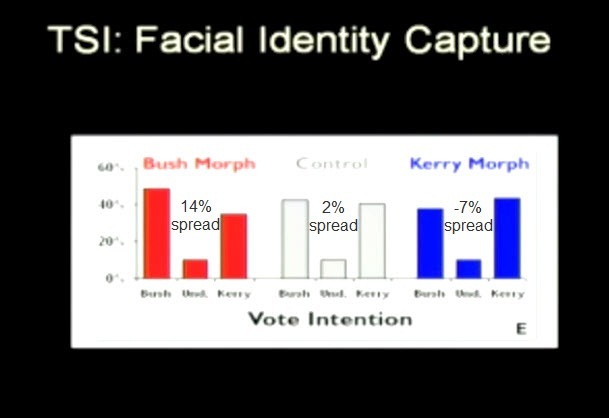 There is a 19% swing between the two morphed alternatives. Just by making the politician’s appearance look a bit like the volunteer, we can change the outcomes of elections. This capability to manipulate images and behavior (and to hide the fact from the other party) presents a significant ethical dilemma in virtual worlds. As with most things it can be a force for good but in the wrong hands can be very dangerous. There are a lot of people who are worried about social networks and behavioral targeting (advertising customized to your behavior) – what is to stop advertisers from presenting ads on facebook using pitchmen that deliberately share your characteristics in order to increase your propensity to buy? This entry was posted in culture, Digital Content, social media, Telecom, virtual worlds and tagged avatar, behavioral targeting, facebook, manipulation, politics, second life, social_interaction, virtual reality by geoff. Bookmark the permalink.